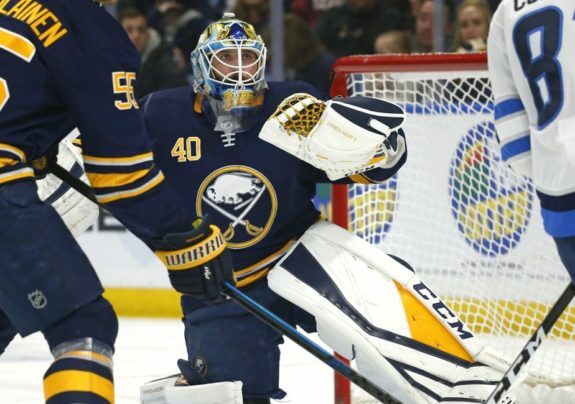 The Buffalo Sabres’ 2018-19 season will likely be remembered as a collection of streaks. Some lasting a month, some a few games and some as little as 27 seconds. Unfortunately, most of them should be forgotten. They’re presented below in order of longest to shortest. The Sabres will miss the postseason for the eighth straight season. Should the Carolina Hurricanes make the playoffs, the Blue and Gold will own the longest active playoff drought in the NHL. Entering the 2018-19 season, the Hurricanes have missed the postseason nine straight seasons, the Arizona Coyotes six straight seasons and the Vancouver Canucks three straight seasons. Digging a little deeper, the following list shows the teams with active post-season series win droughts heading into this season. This includes either by failing to qualify for the playoffs in a season or by making the playoffs in a season but subsequently losing the first-round series. The Sabres have just four playoff appearances since 2001. 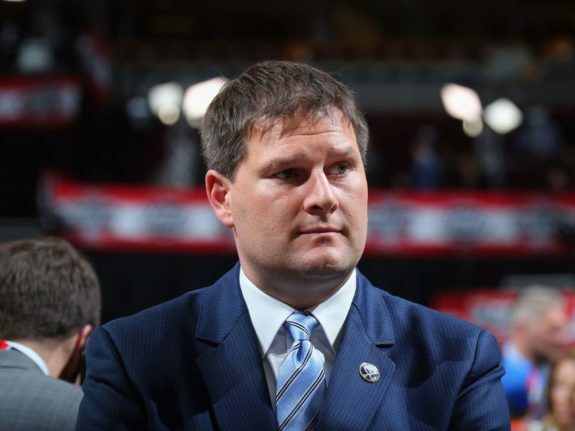 After a 78-point season in 2016-17, general manager Jason Botterill and head coach Phil Housley took the reins from Tim Murray and Dan Bylsma. In their first season, they led the team to a 62-point, 31st-place finish. Backwards. This season the team is likely headed for a mid 80-point finish. With arguably more talent on this roster than last year–noting newcomers Jeff Skinner and Rasmus Dahlin–in many ways this season has been more disappointing than last season. It appears as though they will both finish the year employed by Pegula Sports and Entertainment. The Sabres still have not won two straight games since mid-December. They have one regulation win in their last 16 games and have been outscored 62-35 in that span. The worst NHL team for an 82-game season was the 1999-2000 Atlanta Thrashers. They went 14-57-7-4. The Thrashers’ longest stretch between two-game win streaks was 94 days. Tuesday, March 19 is day No. 96 for the Sabres. It was a November to remember. The Sabres won 10 straight games, tying their franchise record. Nine of the Sabres’ 10 wins during the run were by one goal, and seven were decided in overtime or a shootout. Only the 2012-13 Pittsburgh Penguins have as many one-goal victories as part of a winning streak of at least 10 games. 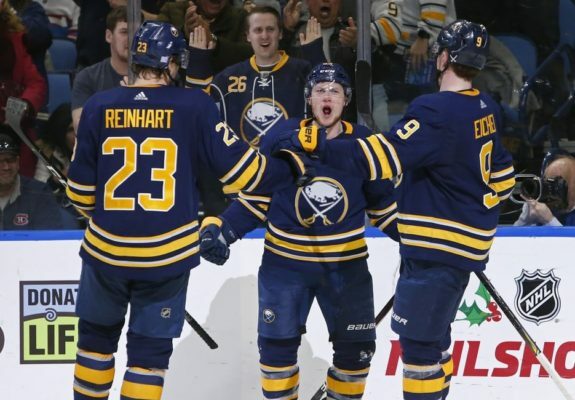 The expectations-defying run shot the Sabres up the standings. At one brief point, they were even atop the league standings. First place overall… a distant memory. The Sabres defeated the Blues in overtime Sunday night to snap their season-long seven-game losing streak. It was a welcome ‘W’ as the team was dangerously approaching the dubious distinction of becoming the first in NHL history to win 10 in a row and lose 10 in a row in the same season. The Sabres were shut out in three straight games. They lost to Avalanche 3-0, Dallas Stars 2-0 and Penguins 5-0. After nearly 200 minutes–199 minutes and 58 seconds to be exact–Skinner put one past his old team, the Hurricanes, to temporarily end the goalless misery in a 4-2 loss. Perhaps more disturbing, it was the second time in franchise history the team has been held goalless in three straight. The first time was last season. In other words, the Sabres have been blanked in three straight games in back-to-back seasons. Stick that ugly feather in your cap, Housley. The shortest streak, but most welcomed and noteworthy one, was an electrifying 27-second span in the third period of the Sabres’ game against the Blues Sunday night. It included board-rattling hits by Zemgus Girgensons, Johan Larsson, Casey Nelson, Marco Scandella and Kyle Okposo. The crowd roared, responding with their appreciation with every subsequent hit. It was a welcome influx of physicality on the ice for a team that’s been called soft by its coach and fans. Equally importantly, it was a shot of adrenaline and life into a barn that’s become nothing but DJ Milk’s noise between faceoffs. If only they could play every game with that amount of intensity and excitement. Where was this play all season? Why can’t every game start like that shift and continue into the next shift and the next? 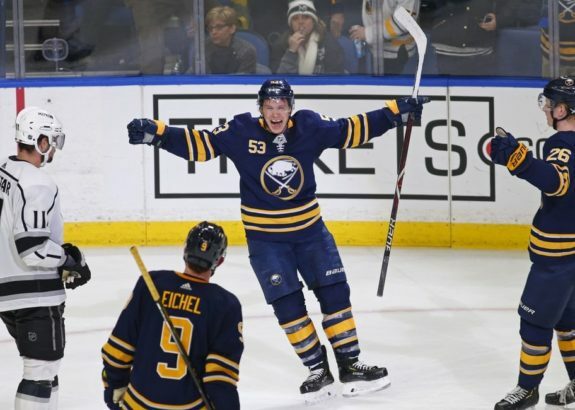 It was far and away one of the Sabres’ most memorable shifts of the 2018-19 season.